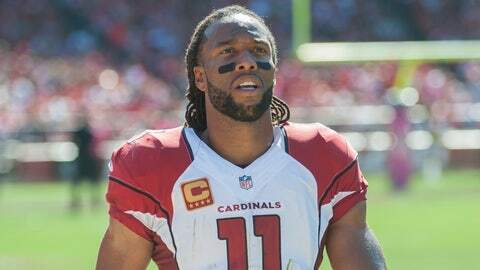 Larry Fitzgerald expects to play Sunday in Seattle after he suffered a concussuion last week against Tennessee. TEMPE, Ariz. — In addition to submitting to the NFL’s concussion protocols this week, Cardinals receiver Larry Fitzgerald saw independent neurologists all week. He will see another one Friday after practice. "He’s not even a Cardinals fan," Fitzgerald quipped Thursday. When asked if the neurologist is a Seahawks fan, Fitzgerald said: "I hope not, (or else) I might have to bring him some brownies." There was a lot of attention paid to head injuries and concussions in professional sports the past several seasons. There is much we have learned; there is much we still don’t know, whether its immediate impact or long-term effects. Fitzgerald is as versed as anyone on that information. But with two independent neurologists telling him he is good to go and two days of physical exertion behind him (one day of practice), Fitzgerald reiterated he expects to play Sunday in Seattle as the Cardinals chase a postseason spot. "It’s concerning. It is, man," he said when the point was raised that we still have much to learn regarding concussions. "But I’m like anybody else. I just want to go do my job, have a good time and play and win and enjoy it while I have the opportunity. "There’s no telling how long I’ll be able to play this game — how long anybody will be able to play this game or live life. I have an opportunity in something I truly love doing — playing ball. That’s kind of how I think about it. "Obviously, I understand the ramifications. I’ve seen the studies and seen the guys that have dealt with issues in the past. I’m aware of all that." Fitzgerald said he worked with a team physical therapist on Wednesday to get his heart rate up and get him "exhausted." He experienced no issues — no headaches nor dizziness — so he was cleared to practice on Thursday, which he said he did fully. He also watched tape for the first time of the hit he sustained while trying to recover an onside kick in Tennessee. "I didn’t see it coming. I was watching the football the whole time," said Fitzgerald, who doesn’t remember the hit or the moments after it. "Things started coming back pretty quickly and I was able to pass my baseline test when I got back to the locker room." Fitzgerald does not think the hit delivered by Tennessee’s Jackie Battle was excessive, although replays seemed to show helmet-to-helmet contact. He said he just didn’t have time to prepare for it like he does when he’s playing offense and is aware of where the defenders are on the field. "In that situation I have no idea where that guy’s coming from so I can’t brace myself. I’m in a vulnerable position," he said. Fitzgerald emphasized that he understands concussions are serious. But in the end, it is his decision to make if he is cleared to play. "This is football. It’s a tough sport played by tough men. It’s my job," he said. "You look at all of our armed forces, men and women fighting around the world. They volunteer for that work. They sustain a lot of injuries. Itâs part of the job I do. I’m not trying to compare what I do to people being in the army or services but it’s my choice." And just when the discussion started getting too serious, Fitzgerald lightened the mood by reminding everyone: "Muhammad Ali got knocked out a couple times." It looks increasingly likely — almost a certainty — rookie safety Tony Jefferson will start Sunday in Seattle. Safety Rashad Johnson was in a walking boot at Thursday’s practice, raising the possibility he is out for the rest of the regular season with an ankle injury. Jefferson, who went undrafted out of Oklahoma, played a bunch in the preseason and saw some time earlier this season when Johnson lost a fingertip against the Saints in Week 3. But he had just five defensive snaps Sunday in Tennessee. "I got my feet wet already so I’m ready to go now," he said. "I’ve been waiting for this opportunity. I’ve been ready the whole time." Defensive coordinator Todd Bowles said he’s not concerned about Jefferson’s preparedness for this game despite his lack of recent reps.
"We make sure our guys that aren’t starting and playing, they have to know twice as much because they don’t get the reps. They’ve got to get mental reps," Bowles said. "You talk to them; you quiz them to make sure they’re sharp because you’re going to need them as some point in the year so you never really leave them out in the cold." Undrafted rookie Curtis Taylor would be Jefferson’s backup.